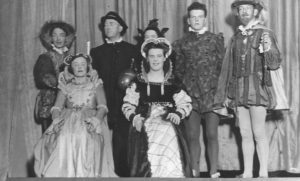 Hilton Drama Club, February 1939, Tain Festival. Back Row, left to right, as viewer looks. Alisdair MacKay, Gordon Crawford [Headmaster], Emma Oliver, Murdo McRae, not known. Front Row. Joey MacKay, Sybil Tarrel.